The South Downs National Park Authority and Learning through Landscapes are running an Outdoor Education Conference – FREE to teachers working in or near the South Downs National Park, come along and take part in experiential workshops and much more…. 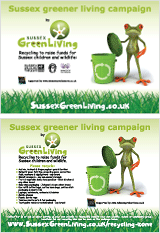 STOP PRESS……… The pupils at William Penn Primary School in Coolham took part in a Sussex Green Living Green Day to launch a special recycling scheme at the school. Launch of Green Johannas at Bishop Luffa School, Chichester.